Mad Max is a lone wolf against a power house ruler who controls the most precious thing left on earth: water. This story is set in a post-apocalyptic environment where all that's left is sand and humans who have lost their minds and are will do anything to survive. Max (Tom Hardy) is captured by the crazy ruler and tries to escape, leaving everyone who isn't key to his survival in the dust. However, Max soon realizes that he needs to help others in order for him to escape. 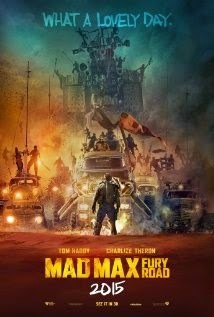 Max and Imperator Furiosa (Charlize Theron) go in search of a new home away from the tyrant ruler. This action-packed show has so many jacked-up cars and tanks — the explosions and chase scenes were crazy awesome! I read during filming the crew did everything to make it look real and didn't use any CGI at all to show realism and destruction. Even Michael Bay might have some competition! Besides cars destroying other cars, there's people crazy enough to lay down their lives for the sake of reaching Valhalla (a paradise after death). If you are familiar with the original Mad Max movies back in the day with Mel Gibson, a friend of mine described the story as not as a sequel but a new storyline. I wish I had seen the original movies before seeing this but there was no confusion and a brief introduction of what has happened before the movie really helped out to understand the situation. Mad Max: Fury Road was fun to watch and to take in the madness. It shows how crazy the world would be if water was limited — people go mad for it. If you're into action and post-apocalyptic stories then this movie is one you don't want to miss.